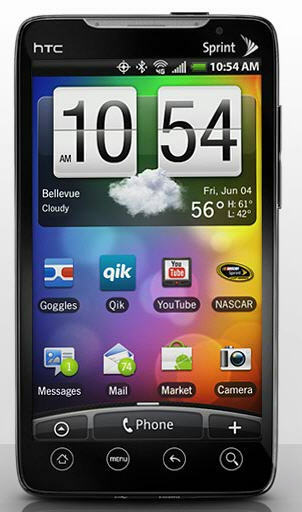 HTC EVO 4G Review - Learn everything you need to know about the HTC EVO 4G before you buy. Someone who doesn't like a great phone. The HTC EVO 4G is a great phone and gives any other smart phone on the market a run for the money (Which is about $150 with a new contract). The major flaws of this phone range from battery life to the rear facing camera sticking out to far. However, the rest of its minimal flaws are masked by a well made phone with awesome features including a super fast processor, a huge screen, Skype calls not requiring wi-fi and an awesome 8 Megapixel camera with a flash. It is a great looking phone with a huge screen which adds to its overall sleek design. The phone itself is a bit bigger than others that are on the market, but nothing to complain about. The only buttons on the phone a volume toggle on the side and the necessary power button; both contribute to its minimalist design (The home, back, search and menu buttons are touch sensitive). Haven't actually found a use for the kick-stand yet, but supposedly it's for table-top video viewing. I usually find If I am in a place with a table and enough time to watch a video, I have my laptop with me or accessible. Nonetheless, still a thoughtful feature in design. The dual LED flash works really well but the flash itself sticks out a bit far. However, now they have cases that protect this part of the phone as well. With its incredibly fast Snapdragon processor, the EVO can handle plenty of multi-tasking. As well, the Android operating system runs as minimalist as you want it to, and the phone comes with the â€œHTC Senseâ€� theme that doesn't weigh down the operating system. HTC's Friend Stream is their social media aggregator which lets you see all of your social networks and updates right on the home screen. You can also pinch anywhere on the home screen and look at all the applications you have open, pick one to go too, or close them from there. This is where the phone falters. The battery life from most of the user reviews I have read and people I have talked to is about 1 day...at most. There are some ways to get more use out of your battery, but the better (more expensive) fix is to buy the battery upgrade. From what I hear, might want to have a charger in your car, at your office, and at home. Of course the phone comes with the standard fare for smart phones-wi-fi, GPS, Bluetooth, and a 1 year warranty. You also have the option to purchase tethering for up to 8 wi-fi enabled devices and unlimited data usage. Only downside, it costs 30 extra dollars a month on top of your data plan. If the 8 gig card that comes with it isn't enough storage for you, you can just buy a bigger one (Expensive, but worth it if you have a lot of music). "Thank you for your existence. I was worried about throwing away my old cell phones into a land fill. I knew eventually someone would be able to take them and put them to good use. Heck, I would have sent them to you for free, BUT YOU PAID ME FOR THEM. Unbelievable. Rest assured that I have notified everyone, I mean everyone, I know...... and a few at a coffee shop one morning that probably suspected I was associated with your company. Your service was outstanding. I received a phone call and an email after I filled out the form on the website to see if I needed any further assistance. Then, after I received the check I got another call to see if I got it. Wow ! As long as you're around, I'll be sending you my old cell phones. Thanks."